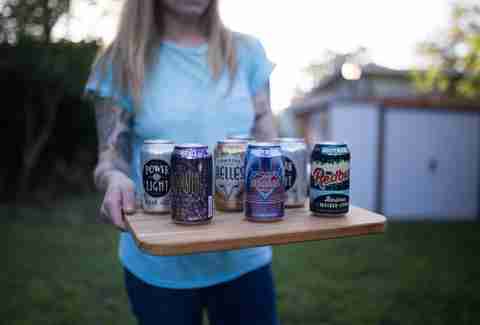 It wasn’t too long ago when grocery store shelves in Central Texas were populated by overproduced, under-flavored domestic beers -- now, even the most casual convenience store in Killeen has a colorful craft beer lineup. 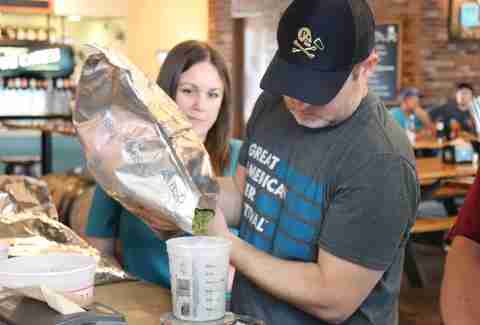 Like so many other cities, Austin has seen a rapid expansion of breweries, from talented homebrewers taking a leap of faith to seasoned pros trying their hand at the taps, and things don’t seem to be slowing down any time soon. 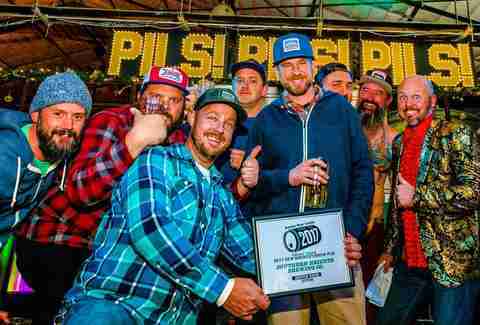 As such, when the topic of “best local breweries” comes up, it’s incredibly difficult to whittle the playing field down to a definitive group. Instead, we’ve decided to highlight the absolute essential breweries you need to visit to be a true Austin craft beer aficionado. Try each of these breweries… and then go out and try some more. The St. Elmo development (which seemingly popped up overnight) is anchored by booze, and alongside Austin Winery, Skull Mechanix, and Still Austin Whiskey, you’ll find the highly (and deservedly) popular St. Elmo Brewing. The seating inside is community-style, with easy access to view the inner workings of the brewery, and the dog-friendly yard plays host to Trivia Tuesdays and live music on Grassy Thursdays. The beers here are named like so many favorite children; take a turn with the classy Evangeline Saison, be bold with the Jan German IPA, or drown the sorrows of the world with Angus. On a hot day, Austinites can’t do much better than a cold Carl Kolsch and some Asian drinking food from onsite food truck SourSop (undeniably one of the best places to eat in Austin). Friends and Allies had a beer even before they had a taproom to serve it in; their Noisy Cricket IPA garnered a cult following pretty quickly, so once their space in Springdale Station opened, it was an immediate hit. This sunny spot with big windows and a modern aesthetic is a frequent destination for fans of the Austin Bouldering Project (next door), and for east side dwellers looking to stay a little closer to home. In addition to their core beers, Friends and Allies features six rotating seasonal options on tap, ensuring variety even for regular patrons. Plus, like many of their brewing brethren, they offer board games and bar games to play while tipping a pint of Springdale White Ale. Southern Heights might be the eastmost brewery that’s still technically in Austin. It’s a little tricky to find, but once you get there, the ping pong table, dog-friendly space, board games, free wifi and rotating brews mean you’ll likely become regular. Breweries can sometimes feel somewhat sterile, but that’s not the case with Southern Heights; their taproom is playfully furnished with bright colors, a funky wall of magazine covers, and the piece de resistance, a VW bus. They have something for everyone, but hopheads will especially dig their juicy IPA selection, sometimes with as many as six on tap. Though we have a ton of great beer in the city proper, beer aficionados know there’s sudsy gold in them thar hills -- and anyway, you’re not truly Texan unless you love a good road trip. Make the scenic drive from Austin to Taylor (or take the $8 train) to visit the compellingly named Texas Beer Co; though still young, they’ve been a force in making Taylor a destination, partnering with the city to host regular events and working to energize the city’s Downtown area. Their taproom is beautiful, and the beers are highly drinkable -- especially the well-balanced Hoppy Duck IPA, and the surprisingly refreshing Blacklands porter. All this, plus barbecue and live music? Yeah, you’re gonna want to start packing the car. You could be forgiven for just thinking these are just pizza joints -- after all, that $10 lunch special is pretty fantastic and their pizzas are made with seasonal, locally sourced ingredients. There’s so much more to Pinthouse, though; they’ve won 20+ awards and accolades for both “Austin’s Best” and national beer awards, their Electric Jellyfish is one of the most intriguingly named (and best-tasting) beers in the city, and they do regular Charity Brew events where 25% of the sales for the entire day go to the monthly partner (with over $100K raised to date). They serve their own beer along with selections from other local brewers, and they change often. Pro-tip: If you want to know what they’re serving, hit up their live tap feed. 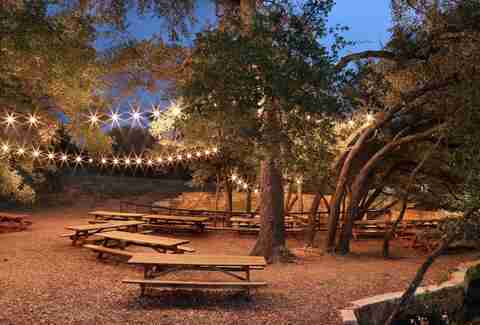 It should come as no surprise that Jester King earned a spot here. This civic-minded brewery has grown by leaps and bounds in a few short years -- you could even argue they’re the reason Dripping Springs has become a go-to for breweries, distilleries, and the like. They’re focused on farmhouse ales and barrel-aged wild ales, and aren’t afraid to experiment either. The brewery is massive, with tons of community space for people to sip suds and hang out; they also have Stanley’s Farmhouse Pizza slinging pies, regular events and goat yoga. Yep, goat yoga. The “Cool Store” was a staple of East 6th street for years before Lazarus Brewing moved in -- and though we were sad to see an OG east side spot go, Lazarus has made up for it in spades. They’ve created an atmosphere that’s friendly and inviting with string lights, comfortable furniture, and a patio outside; their patrons are more like devotees, espousing the virtues of the fantastic food (get the queso fundido), the craft coffee, and of course, their wide range of beer. Their Belgian Amandus and the cleverly named Freudian Slip IPA are both crowd favorites, but they’ve also just released a new beer: an 8% ABV, farmhouse-style Saison called East of Eden. The Oasis is famously known for its breathtaking views and lackluster food -- and though it’s located in the complex, Oasis Brewing is separate and apart from that particular establishment. With its great crafty beers and good food, this brewery has practically resurrected the Oasis complex. Bar games, a dog-and-kid friendly patio, and live music events are some of the draws -- along with the gorgeous sunset views, of course. The food is elevated pub fare, with everything from wagyu burgers to duck poutine, and the beers have won awards at the Great American Beer Festival; Oasis’ Meta Modern Session IPA gets a lot of love, but the smart move is to try a flight for $10 before settling on a pint. 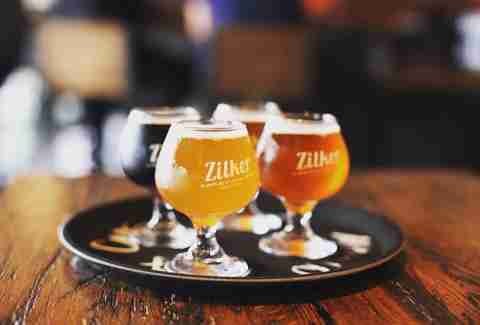 Nestled in the heart of East 6th street, Zilker’s casual and inviting taproom is a good spot for an after-work beer and a bite. The space is large, with community tables and plenty of opportunities to belly up, and the taps feature Zilker’s own brews along with a rotating selection of craft classics. If you’re in the market for food, Hot Mess is the onsite food trailer slinging burgers, tacos and wings. 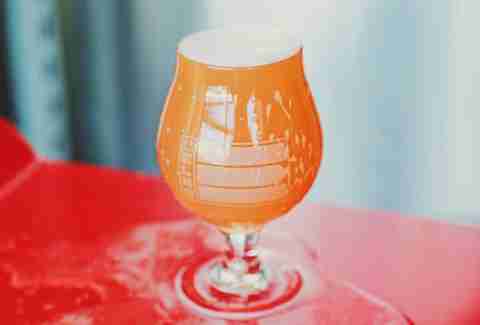 They aren’t afraid to play around with beer here, and their latest -- a margarita-inspired sour called Top Shelf -- has earns them props in the adventurous brew community. Self-distributed and draft-focused, this brewery is prolific and wildly popular with several staples on tap around the city. 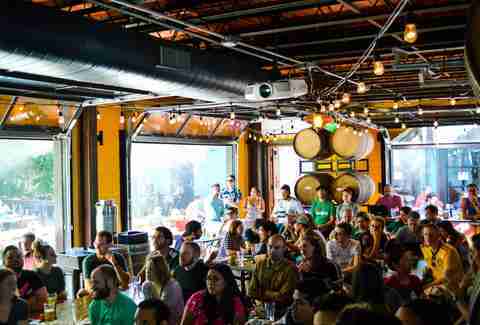 They focus on using local and organic ingredients along with Austin water in all their crafts; beer-lovers flock to their taproom during the Saturday happy hour between 12-4pm, for a ticketed tour and a taste. The price for a flight is right - just $12 for your choice of six 8-oz pours. There is no inside seating and they don’t have food onsite, so if you’re planning an outing, prepare to BYO and check the weather. Oh and get a Lyft home -- that IPA will take you down for the count. This brewery is loaded down with medals -- most recently, two golds at the Great American Beer Festival along with Large Brewpub of the Year and Large Brewpub Brewer of the Year. Beer snobs love it, but so do families and folks just looking for some fun; the beer garden features regular live music performances, and a lovely food menu that’s sourced locally and adjusts to the season. They’ve also pioneered the Hell Yes Project, teaming up with selected non-profits around Austin to donate 5% of profits from the cool events and parties they throw throughout the year. Make sure to drop in for their 5th anniversary, taking place on September 2nd. Tucked back in an industrial-esque complex, Hops and Grain has made a huge impact on the east side. People love The One They Call Zoe, an American lager and the Greenhouse IPA, but Hops and Grain isn’t afraid to branch out, either; they’re currently experimenting with a mixed culture Saison program, and will do a limited release later this year. There’s also a San Marcos location in the offing! 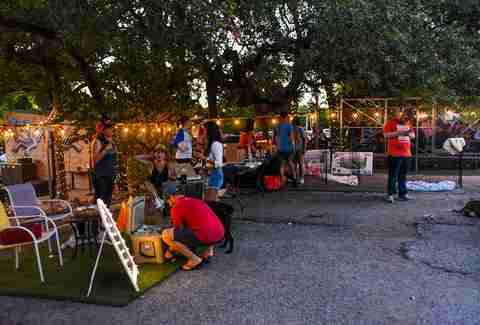 Like all good Austin breweries, they are heavily engaged with the community, hosting tons of events (especially as they pertain to pet-focused non-profits -- they even reuse grains post-process and turn them into dog treats). What were you doing in 1997? 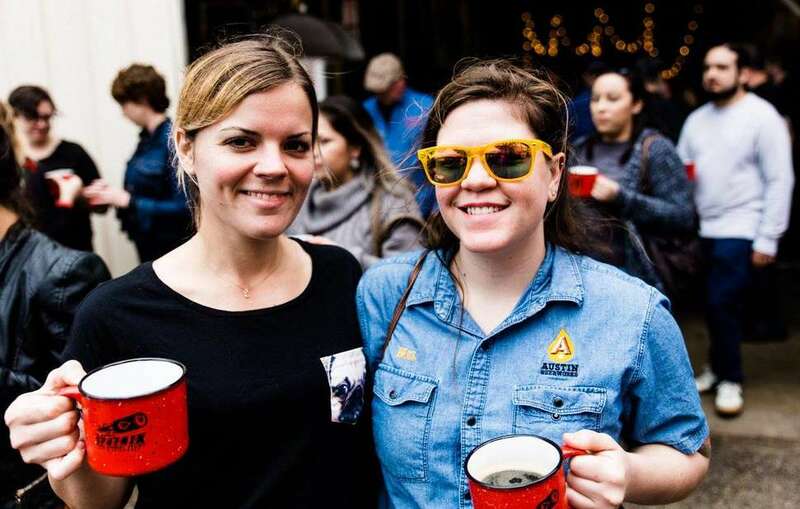 Because that’s when Live Oak Brewing make its grand debut on the scene of Austin beer, and though they’ve moved from their original home in East Austin, their dedication to the craft remains the same. The new location can reasonably be dubbed a campus, with a huge, shady biergarten, an on-site food truck, and a full-on disc golf course. There's also a 2nd Sunday Family Day every month (except for August) that features family-friendly entertainment and bounce house for kids. Founded by Pierre Celis in 1992 and closed in 2000, Austin’s original craft brewery was resurrected 17 years later by Christine Celis, the founder’s daughter and original partner. They still serve Belgian-style witbiers in their taproom anchored by a striking rotunda made from of the original copper mash tuns. Onsite you can taste Celis originals plus brews from Uncle Billy’s, and you can mix and match any of them in a $10 flight. The taproom has snacks available for purchase along with a rotating food truck, plus board games and ping pong; the calendar is pretty packed with great events, too, like the Shrimp Mayhem event August 4th. While you’re in the area, stop in at neighboring breweries Oskar Blues and 4th Tap. Austin Beerworks keeps coming up with serious winners -- most recently, their Super Awesome Lager took home the 2017 Great American Beer Festival Gold in the light lager category. Their Pearl Snap and Fire Eagle IPA are infinitely drinkable, the kind of beers you recommend to a friend that’s just figuring out they love craft beer. They’ve also significantly leveled up their hosting game with a big, beautiful taproom designed to cater to the masses; you can buy many of their core beers in-store, but the taproom has specialty drafts you can only get onsite. Stop by here on a sunny day for $4 pints, a dog-and-kid friendly patio, and their food truck the Can Tina. Rob and Amy Cartwright started Independence Brewing in 2004 and after years of going it alone, got a solid injection of capital from Lagunitas in 2016. They’ve continued to produce strong, playful beers with frequent references to Austin icons. Austinites will recognize a staple of Austin 70s nightlife in the Liberty Lunch IPA and one of our favorite off-leash dog parks in the Redbud Berliner Weisse. Their First Saturdays at the brewery are legendary - like a giant awesome tailgate with great bands, brewery tours, rotating food trucks and a $10 wristband that hooks you up with three pours.